« Flowers make me happy. that I started last night has taken all today and much of the evening. Right now, I’m just tired and sore! I sat on the floor and put together a bunch of those 12×12 cubes from Target last night, and today I cleared most of the stuff from the closet and rearranged it all. Sometimes I feel like I do more reorganization and rearranging and shopping than actually creating! 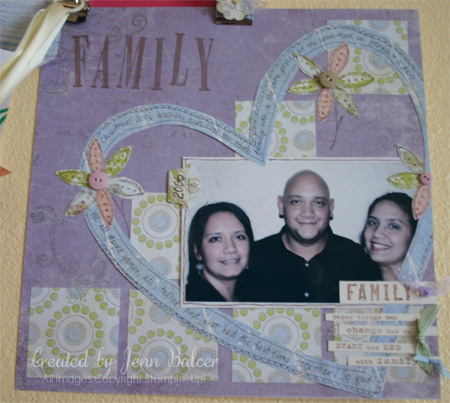 I took a little break and did a quick page based on a layout from last month’s Creating Keepsakes magazine. I was flipping through stacks and stacks and stacks of magazines (deciding which ones to keep) and loved this layout. With the Doodle This set and Basic Grey’s Lily Kate patterned paper. . . Ooh yeah, it’s fun to make stuff again! I should get back in there and finish cleaning up, or at least rearrange the stuff enough to make room to stamp! I’m generally behind the camera at all the family events, and tend to take a ton of pics of all the kids. This time ’round, I made sure to get pictures of my brother and sister and me as well as the kids and my parents. We celebrated Christmas early this year, so I was able to make a little album with all of the grandkids and kids to give to Mom on Christmas day. I’m sure she’ll love this page and take it home tomorrow to add to her book! OH that is my style of cleaning Jenn! i get distracted and create something every time! Love your layout and great family pic! Just gorgeous my friend. Love the heart and all the doodles. Great layout!! This is just adorable, Jenn, but when do we see the stamp room? Jenn, your page looks amazing! I love the big old heart cutout! I am excited to see you stamped!!! I love your layout. The text from the “That’s Nice” stamp looks great cut apart like that.